This is a terrific vegetable soup recipe. In fact, it's so good that when we tried it we immediately contacted Dynise Balcavage and asked her if we could share it with you! She graciously consented and now you can enjoy it too! Humble and Hearty Vegetable Soup may be a little too modest for this soup recipe. We think it is absolutely delicious. It deserves bragging rights rather than humble acceptance! One of the many things we like about this delicious vegetable soup is that it utilizes barley! We love barley. Barley has a relatively low glycemic index which is important for maintaining healthy blood glucose levels. It's also a great source of dietary fiber and actually contains both soluble and insoluble fiber. Soluble fiber is effective in lowering blood cholesterol and can reduce the risk of heart disease. Soluble fiber is also beneficial in slowing the absorption of sugar and reducing the risk for developing type 2 or non-insulin-dependent diabetes. The insoluble fiber found in barley may be beneficial in helping the body maintain regular bowel function. Insoluble fiber may also help lower the risk for certain cancers such as colon cancer. It is also naturally cholesterol-free and low in fat. In addition to all of that barley is also rich in vitamins and minerals, anti-oxidents and phyto-chemicals. 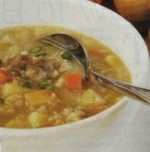 In short - barley is good for you and this humble (well) hearty (yes) vegetable soup recipe is too! Heat oil in a large soup pot on medium low. soft, about 5 to 10 minutes. carrots and potatoes are soft, about 45 minutes. This hearty soup is so tasty! It is a snap to make and it's filling, nutritious and very satisfying.